It’s October and Lansing resident Kennedy Barnwell, 4, who is eligible for the Great Start Readiness Program, is still not in school. Her mother Brittany Johnson, 27, has made several attempts to get her daughter in a classroom, without success. So Kennedy is stuck in what she likes to call "day-care school" to let everyone know she is still getting some type of education. As recently detailed by Bridge Magazine, thousands of Michigan preschoolers eligible for publicly funded classes are not being served due to inadequate state funding, logistical hurdles and poor coordination of services. Johnson originally had her daughter signed up for the GSRP at Reo School in the Lansing School District. But when she found out that GSRP had no means of transportation for their students, she sought other options. "I would have had to get her there and pick her up but my job isn’t flexible … I went back to the place where you sign the kids up and I said to the woman, 'I can’t remember her name, Reo is not an option,'" said Johnson. "So I asked if my daughter could go to another school or if I could find a day care that could bus her to a school. She was like, well, if you find a day care that can bus her to another school we can probably get her in." Johnson was able to find Helping Hands Christian Child Care, a day care that would provide transportation for her daughter. But in order for her to receive that transportation Barnwell would have had to be in the GSRP program at Wexford Montessori, not Reo. "I went to Wexford to talk to the principal and she said they had openings there. The lady at (GSRP) called and said a girl had dropped and Kennedy can get put in that school," said Johnson. So, Johnson began buying Kennedy school supplies and a Dora the Explorer backpack. But when she went to the orientation on the first day, she found out that her daughter had been wait-listed. "It was a miscommunication between the principal, me and the woman from the GSRP program," said Johnson. "I went up there to make sure everything was situated. But I guess they were talking about another girl being accepted into the program and not Kennedy. The lady from Great Start said, 'Your daughter didn’t get in’ and ‘you are on the waiting list.’ She said Wexford is full so she would have to attend Reo." Wexford Principal Nancy Lubeski said she vaguely remembers the incident, but the school has had "a few mishaps with the program this fall." Lubeski said that it was probably because there are two programs at the school for 4-year-olds. The pre-K program had openings, but, unlike the GSRP, it has fees. "A lot of parents are new to the school system. When parents are enrolled in one they are really enrolled in the other one," said Lubeski. "You can’t be accepted into the program and transfer to any school. You need a letter stating that you are accepted into the GSRP program at that school." 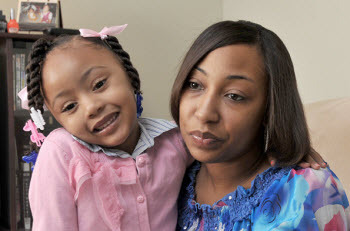 After many calls, visits and false starts, 4-year-old Kennedy is only in day care. "When I told her it was time for us to leave (at Wexford), she started crying. She was just so excited to be in a classroom setting. She’s been wanting, waiting to go to school since she was like two," said Johnson. Though her daughter is eligible for publicly funded preschool, Johnson is paying about $50 a week for the Helping Hands day care. She said her day-care costs will possibly be "cut in half if Kennedy was just going to daycare before and after school. "I really, really want her to go to school," said Johnson. "I feel like a day care can’t really teach the kids what they are supposed to learn. I don’t believe they have the right fundamentals for the kids." Taylor Trammell is the 2012-13 Center for Michigan journalism student fellow. She is pursuing a journalism degree at Wayne State University. The truth is most child care centers do an excellent if not better job of teaching children. You as a parent need to find those centers and the bulk of the cost is picked up by the state if you qualify. The Great Start Program is a good program but is not the only option out there for children. There are also Head Start Programs for children in place. If people are truly interested in making pre-school and option for all children, there would be better funding for start up child cares and the programs in place would get the same 'free money and supplies' the Great Start program gets. Children can and do learn everything they need for a 'good start' in child care settings.